Have you ever imagine that only a 6 antennas jammer device can block the signals of all the 3G 4G mobile phones signals and at the same time block the signal of the Lojack? 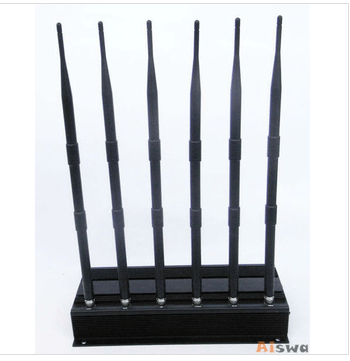 Then this 6 Antenna 3G 4G Cell Phone & Lojack Jammer that you are viewing here owns the function. And you can see the details of this cell phone and Lojack jammer here. This signal jammer is a multifunctional jammer device that owns the can play the role as the 3G 4G cell phone jammer and the Lojack jammer. And because of owning 15W high outpour power the jamming radius of this one is reach up to 40 meters at most depending on the signal strength in the given area. Besides there is no need for you to worry that this 3G 4G cell phone jammer will produce high temperature when it is working as good cooling system with cooling fan inside has been applied on this jammer and so that it can work 24/7 non-stopped. Although it is a desktop cell phone and Lojack jammer, it can also be used in the car directly as it is designed with charger which is really convenient for the people who want to use it while they are driving.